Financial services was one of the first industries to put whistleblower policies in place. It's a heavily regulated, high-pressure industry dealing with large sums of money. When misconduct happens its high profile and these reasons created the need for employees to be able to report misconduct. Many of these whistleblower policies were effective on paper but were difficult to execute on. An effective whistleblower program depends on anonymity. Yet, many of the reporting channels used such as hotlines, email, forms, or snail mail did not provide for a truly anonymous program. Employees knew this and feared retaliation if their identity became known. Thus, they refrained from reporting misconduct. This lack of reporting has become clear from the recent Financial Services Royal Commission. The banks accused of misconduct all had whistleblowing policies in place. The issue was employees did not feel comfortable reporting misconduct. These offline whistleblowing programs failed as they were not able to identify the risk early enough for the banks to take action. So, what can banks and financial service companies do to fix this? Whistleblowing has moved online. There are now platforms allowing employees to submit anonymous reports online, on their mobile phone, and even through anonymous live chat and email. 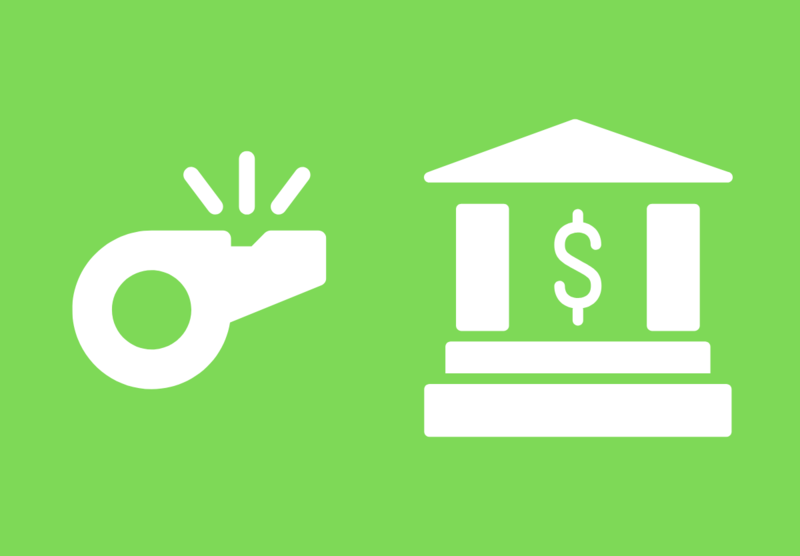 In this article, we talk about how financial services firms can improve their whistleblower program by taking it online. We'll also detail the benefits you can gain through using an online platform. Financial services firms using an offline whistleblower program have a greater challenge keeping an informant’s identity anonymous. Submitting reports via a hotline, email, a form, or through the post all leave ways to identify the whistleblower. Identification could be by an accent, an IP address, the location stamped on the post, etc... These pieces of information can help identify the whistleblower or shortlist who they might be. The CEO of Barclays Bank, Jes Staley, did exactly this when he launched a campaign to identify a whistleblower. Based on information the bank had on the informant, he asked his team to investigate and find out who submitted the report. In the upcoming Australian whistleblower legislation, fines can reach up to $1 million for revealing (whether on purpose or accidentally) a whistleblower's identity. An online whistleblower platform provides a much higher level of anonymity than traditional offline methods can provide. It can strip out identifying data like location, IP address, etc. when a whistleblower makes a submission. Submitting a report online or via a mobile phone also helps employees feel their reports are anonymous. They are not bound by reporting in the office and can make a submission anywhere they have an internet connection. With more banking employees coming from Gen Y and Gen Z, their expectation is that online is the only way to make an anonymous report. Calling a hotline or filling in a form is something they don’t feel comfortable doing. They no longer do this in their daily lives and their main worry is this will reveal their identity. With an online whistleblowing platform, they use familiar channels for making anonymous reports (web, mobile). When employees believe they'll remain anonymous and their company will not retaliate against them, they will make more reports. It’s proven that whistleblowers are the most effective way to identify fraud. They flag up 40% of fraud cases, compared to only 15% identified by internal audit*. It's our experience that when companies move to an online whistleblower platform, including those in financial services, they see a marked increase in reports. Typically, there is a spike once their platforms are live. After this initial spike, they see an overall higher level in the long term as employees now feel comfortable in making reports. For complex, highly regulated companies like banks and financial services companies, increased reporting helps identify blind spots. Companies that can spot misconduct sooner can also address it before it becomes a bigger financial and reputation risk. Offline whistleblower programs are a one-way communication channel. You can receive the initial report and keep the whistleblower anonymous. Or, the whistleblower needs to identify themselves to enter into a conversation with you. This holds both parties back. For the organisation, they often don't have a full picture of the misconduct from the initial report. For the whistleblower, they either need to risk identifying themselves or remain anonymous and never receive feedback on their report. An online whistleblower platform solves this problem. It allows the informant and the organisation to engage in an anonymous online conversation. By removing identifying details like contact details, IP address, and location, the two parties can chat in a confidential, anonymous nature. The organisation now can gain more information about the misconduct reported. And the whistleblower gets to provide information and receive updates while remaining anonymous. In specific cases, the whistleblower will need to ultimately identify themselves. With 2-way anonymous communication, they don't have to identify themselves immediately. They can engage with a case manager and choose if and when to reveal themselves at any point in the process. Misconduct in the financial services industry has a huge impact on the reputation of banks and financial services providers. Much of the misconduct we are hearing about started small. It happened, managers tolerated it, and it grew larger due to inaction. By the time senior executives and the board became aware, it was too late. Instead of proactively addressing smaller risks, they now are reactively dealing with much larger issues. We now see corporate boards wanting to have greater visibility into allegations of misconduct. They want to spot misconduct sooner and when it is much easier to deal with. An online whistleblower platform helps provide this visibility. Executives can receive alerts when the organisation receives reports of misconduct. They can also see top-level reports, analytics on misconduct, and understand where it is happening. With everything in one platform, it provides transparency on what was reported, when it happened, and the steps taken to investigate and address the issue. Having all reports in a platform also helps the board holistically see what is happening in the organisation. This helps them identify trouble spots, whether a business unit, office location, or country. For financial firms with multiple business units and offices, this helps spot leadership or cultural problems. Many legacy whistleblower programs are offline in nature. Being offline, it is difficult to track or record everything that is happening. From the initial report to the steps in the investigation, there tends to be a lack of information on what's happened. While this is a challenge for management, it's an even bigger risk if a plaintiff's lawyer or the government requests this information. An online whistleblower platform solves this problem. As activities are taking place online, every step is logged and tracked automatically. From the informant submitting the report, assigning a case manager, to all communication, you have a complete audit trail. Investigations in banking and financial services tend to be more complex and higher stakes due to the industry. An online platform provides you with more transparency. Through established workflows (also online), you have more control over the investigation and the steps taken. Moving from an offline process to an online platform provides a better experience to employees submitting anonymous reports. Besides helping the employee protect their identity and remain anonymous, it's also much easier for them. Their overall journey in reporting misconduct is much simpler with an online platform. With 2-way anonymous communication, they also are able to talk with a case manager, which provides more confidence than submitting a report and just hoping something will happen. The 2-way anonymous communication also helps case managers update whistleblowers on the progress of the investigation, what the results are, and the whistleblower gets the satisfaction of feeling they have been heard. This experience has a feedback effect, especially as the company takes action. This increases reports, which helps you better identify risk. Over time this can help change the culture of a financial services firm and help it have more transparency and accountability. From the Financial Services Royal Commission, it has become clear that the traditional way of managing a whistleblower program has not been working. It’s too manual, not anonymous, easy to ignore, and the net result is that employees do not use it to report misconduct. It takes more than an online whistleblower platform to have an effective whistleblowing program, but it's a key piece of the puzzle. Combining a platform together with a solid whistleblowing policy will help you better identify risk and blind spots in your organisation.